The Pharmacists' Defence Association has submitted its 'Road Map for Scotland' proposals for strategic change, to the Scottish Government's review of NHS pharmaceutical care of patients in the community. Under the PDA’s Road Map for Scotland a substantive number of pharmaceutical care services would be provided through a contract independent of the current pharmacy contract for medicines supply, making greater use of pharmacists’ skills, improving medicines use and increasing collaboration between pharmacists and GPs. The PDA proposes that pharmaceutical care services should be provided by two categories of pharmacists – patient facing and clinic pharmacists. The patient facing pharmacist would provide a medicines supply and advice service to patients on a walk-in basis, while the clinic pharmacist would provide a more detailed pharmaceutical care service to patients with long term conditions on a registered patient, appointment-led basis. Clinic pharmacists would provide a range of pharmaceutical care services that are currently handled in general practice, releasing GP capacity to use their skills to better effect. Delivery of this vision will require genuine collaboration, integration and then contractual alignment between the medical and pharmaceutical professions. It would be supported by the already more clinically orientated training of pharmacists and would need to be linked to revised mechanisms for service provision and workforce planning. Road Map proposals could release over £100m of resources for the Health Service in Scotland through reduced hospital admissions and A&E visits, reduced medicines waste, and improved outcomes. Under the PDA proposals, the patient facing pharmacist would continue to provide both reactive and proactive pharmacy services to the public to include public health services and, most importantly of all, ensuring that patients receive their prescribed medication safely and that it is accompanied by all of the necessary advice. The clinic pharmacist would largely be providing their service from the consultation room, as their service would require a much more detailed and complex one-to-one interaction with the patient. Pharmaceutical care that is person-centred, safe and clinically effective for every patient, every time, is the best way that pharmacy can contribute to the Scottish Government’s ambitions under its Healthcare Quality Strategy, according to Dr Hamish Wilson, joint leader of the on-going Review of Pharmaceutical Care in Scotland. Good pharmaceutical care can integrate with the wider national health strategy, empower patients, improve safety and make best use of pharmacists’ skills. And pharmaceutical care that supports people to live longer, healthier lives at home or in the community can help shape the Scottish government’s ’20:20 vision’ of sustainable, high quality healthcare. The Review is due to make its final report to the Scottish Government in October. 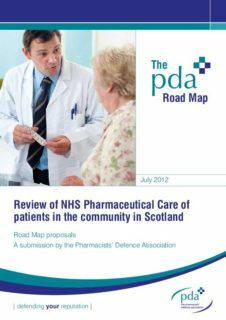 The full document, ‘Review of NHS Pharmaceutical Care of patients in the community in Scotland: Road Map proposals’, can be downloaded from the PDA website here.